Today’s defence-related news includes speculation that the Army is on standby to assist if the UK leaves the European Union without a trade deal, and coverage of a new mental health scheme for veterans. A number of outlets, including the Daily Express, Daily Mail, Daily Mirror, Daily Star, Telegraph and Daily Record follow up on the Sunday Times story on supposed ‘no-deal’ preparations, including the potential for the Army to help deliver supplies. We have received no formal request from other Government departments to assist in their contingency planning for a no-deal Brexit. The Daily Telegraph reports that military veterans are to be offered extra help from the National Health Service under a countrywide scheme to help them adjust to civilian life. The scheme will see GPs becoming ‘veteran friendly’ under the plan, which will identify former military personnel and ensure that support is available, the paper says. The Guardian carries a story on a survey commissioned by campaigners and charities, including Child Soldiers International, which shows that nearly three-quarters of people believe the minimum recruitment age for the British Army should be raised from 16 to 18. Some 72% of people who expressed a view believed young people should not be able to join the Army until they are 18. One in 10 said they believed the minimum age should be 21. Joining the Armed Forces gives young people the opportunity for a great career and we are proud of the opportunities we can offer to recruits. We take our duty of care for all personnel extremely seriously and ensure under-18s are not deployed on operations that would expose them to hostilities. 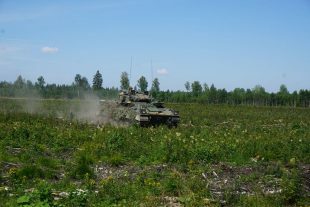 Image of the day: Burma Company of 1 YORKS develop their battle craft skills and learning to operate in the Baltic environment alongside C Squadron The King's Royal Hussars and our Danish and Estonian Allies on Operation Cabrit in Estonia. Crown copyright.